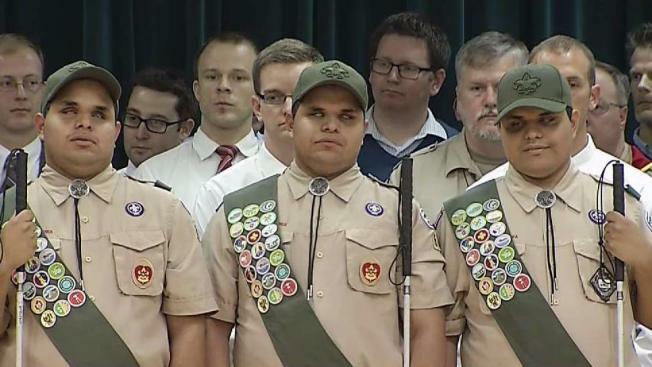 For the first time in history, blind triplets have earned the highest ranking in the Boy Scouts of America. Leo, Nick and Steven Cantos did it all — whitewater rafting, ziplining, archery, knot-tying, learning first-aid skills and more — without being able to see. They mastered every badge required to become Eagle Scouts. The Boy Scouts said the 18-year-old triplets weren't allowed any shortcuts, and they earned the ranking under the same conditions as their peers. "The badges we earned helped us become better people,” Leo Cantos said. The brothers said their favorite part of the accomplishment was their community service project because it allowed them to help those less fortunate. They conducted a blood drive and collected school supplies for children in need. More than a hundred family members, friends and fellow Scouts, as well as U.S. Sec. of Labor R. Alexander Acosta, watched them receive the honor at a ceremony Wednesday night. The teens from Arlington, Virginia — all born blind — celebrated their achievement with their adoptive father Ollie Cantos, an attorney who is also blind. He met the triplets when they were 11, and he says he found them living in a life of fear. But Nick Cantos said his father has helped him to keep going when he was scared. "A person who shows courage in a time of fear can do anything," Nick Cantos said at the ceremony. Before they met Ollie Cantos, the boys were living with their mother, who was struggling to raise them on her own. Leo Cantos said the boys "rarely went outside" when they were younger. "Every day was like: Wake up, go to school, come back home, and then you stay there for the rest of the day," he told NPR in 2014. "There were certain things that I wish I could do, like I wish I could go out and play in the snow like everyone else. 'Cause I've heard kids through the window — we could hear that they were having fun." Once Ollie Cantos got word of the children's situation, he reached out and started helping the boys navigate the outside world. He said he felt for the brothers — as a blind teen he also faced isolation and bullying. So the attorney took the boys under his wing, teaching them how to use their canes more strategically by sending them into the local corner store for practice, NPR reported. In time, their bond grew so strong that Ollie Cantos decided to formally adopt the boys. "They have recognized the fact that contrary to their earlier years, when they were bullied, when they were told that they weren't worth anything by other kids — they now know with an absolute certainty not only do they have inherent priceless value, but so does everybody else," Ollie Cantos said. As a surprise, the teens received Aira smart glasses, which will connect them to someone who can see their surroundings in real time. The glasses will help them with daily tasks and activities like navigating busy streets and recognizing faces.